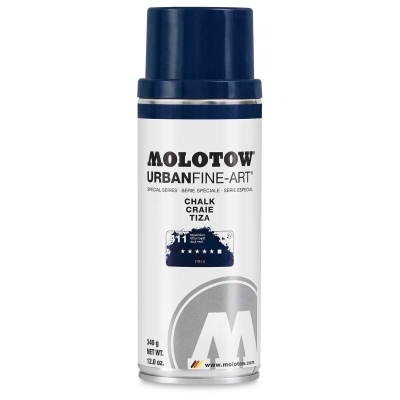 Made in Germany and optimized for fine art, Molotow Urban Fine-Art Chalk Spray is a highly pigmented, lightfast spray that dries to a super cool, chalk-like finish. Able to be applied on virtually all surfaces, both indoors and out, it's ideal for temporary marking and easily removable with water (for permanence, simply seal with Molotow Urban Fine-Art UV-Varnish). Urban artists are sure to love it, not to mention students and teachers. Molotow Chalk Sprays feature Molotow's innovative, anti-drip, Flowmaster Vari-Valve, which guarantees controlled output and extra-smooth handling, even for inexperienced users. Resistant to dripping and excessive spray dust, the Flowmaster also allows for stroke widths ranging from 4 mm to 200 mm with one single spray cap. Molotow Chalk Spray is part of the Molotow Urban Fine-Art system of interworking, professional-quality, acrylic media. The system includes Molotow Artist Acrylic Spray Paint, One4All Markers, and a range of auxiliaries including primer and varnishes. Colors correspond across the ranges, and all products may be layered or worked together wet-into-wet without fear of incompatibility.